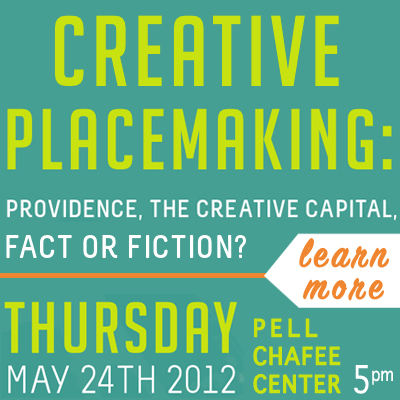 Creative Placemaking: Providence, The Creative Capital, Fact or Fiction? Individual artistic practice can transform individuals. Bring those individuals together, with shared space, programs and experiences, and the transformation expands. The arts animate our communities, bring people together to share common experiences, stimulate our imaginations and help us foster a rich and varied quality of life. The public value of the arts is an ongoing debate. There are those who believe that intrinsic benefits of the arts experience, such as aesthetic pleasure and captivation, have only private, personal value. Many believe, us among them, that both individuals and communities benefit from the arts. On May 24th, AS220 and Providence Department of Art, Culture + Tourism will host the Pell Lecture, an annual lecture honoring the late Claiborne Pell, who represented Rhode Island in the United States Senate from 1961-1997. He is best remembered for being a champion of education, the arts and humanities. The panel will discuss the role of arts and culture as a tool for revitalizing communities, looking at the structure and dynamics of community arts infrastructure. Investigating the power of arts and culture to recharge and rebuild communities. Maria Rosario Jackson, PhD, is a senior research associate in the Metropolitan Housing and Communities Center at the Urban Institute (UI) and director of UI’s Culture, Creativity and Communities Program. Her research expertise includes neighborhood revitalization and comprehensive community planning, the politics of race, ethnicity and gender in urban settings, and the role of arts and culture in communities. Her projects in cities throughout the United States have explored the role of intermediaries in comprehensive community planning, the characteristics of place that lead to cultural vitality, the measurement of arts and cultural vitality and the integration of new topics into policies and programs concerned with quality of life. Dr. Jackson’s work has appeared in academic and professional journals as well as edited volumes in the fields of urban planning, sociology, community development and the arts. She has been a speaker at numerous national and international conferences focusing on quality of life, changing demographics, communities and cities of the future, and arts and society. She currently serves on the boards of the Association of Performing Arts Presenters, the National Performance Network and the Alliance for California Traditional Artists. Formerly, she was on the board of the Mid-Atlantic Arts Foundation and the Fund for Folk Culture. Jackson earned a doctorate in Urban Planning from the University of California, Los Angeles and an MPA from the University of Southern California. Colin P. Kane is Chairman of the 195 Commission, a Rhode Island workgroup tasked with the redevelopment of 40-acres in downtown Providence created by the relocation of Interstate 195. Preliminary planning and engineering studies on the former Jewelry District highway lands are underway. The Commission will buy and sell land, lead rezoning efforts, plan infrastructure and guide the redevelopment of 40 acres that is newly reconnected to the heart of the city by the relocation of the highway. Kane is also the lead partner at Peregrine Group, LLC for project transactional activities, project planning, asset acquisition and sales, leasing, financial analysis, permitting/due diligence, and debt/equity capitalization. Recent projects include the acquisition, planning, and financing of Rumford Center (as a principal owner), a $40 million mixed-use redevelopment of a 9-building, 8 1/2 acre mill campus, the acquisition, permitting, financing and project management of The Ocean House, a $150 million seaside hotel and residences, and ongoing asset management of the American Locomotive campus, a 200,000 sf office mill adaptive reuse. Prior to helping found Peregrine in 2001, Kane worked as a Development Manager for Gilbane Properties. Kane currently serves as Admiral of the RI Commodores, appointed by Governor Lincoln Chafee. Manya K. Rubinstein is co-founder and publisher of Outpost Journal, an annual non-profit publication on art, design and community activism in smaller cities, as well as Bandit Consulting, an online marketing consultancy. Prior to that, she worked at Google for 3 years as a Senior Analytical Lead and before then at CondeNast, with stints at PAPER magazine, The New Yorker, Vanity Fair, and CondeNet. She is currently an associate partner at Social Venture Partners RI, as well as an advisory board member for The Wooly Fair Art Carnival and the Institute of Doctoral Studies in the Visual Arts. Rubinstein holds an MBA from Columbia University, an MA in Media Studies from the European Graduate School, and a BA in comparative literature from Brown University. Marc Levitt is a writer, storyteller, educator, radio and TV host, filmmaker and audio artist living in Wakefield, RI and NYC. He has won awards for his story recordings, for work in his unique musical/narrative historical storytelling style, for his work in radio and for his work in the arts and in the humanities. A 1971 graduate of Cornell University, Levitt has also created the nationally recognized Charles Fortes Elementary School Museum-in-a-School Project and the educational philosophy called Site Specific Education. Marc has performed, lectured and given workshops throughout the United States and around the globe. Sponsored by RI Council for the Humanities, The John Nicholas Brown Center for the Public Humanities and Cultural Heritage; Durkee, Brown, Viveiros, Werenfels Architects; Barbara Sokoloff Associates; The Hotel Providence; and Trinity Repertory Theater.